Robert Kurson is back again with another story of adventure, exploration and humanity with Pirate Hunters . In Pirate Hunters, John Chatterton, one of the main characters of Kurson’s previous book Shadow Divers , embarks on an expedition to locate and salvage the wreck of the Golden Fleece, a pirate ship lost in the 1600s off the coast of the Dominican Republic. 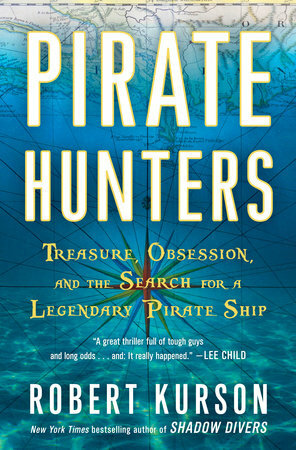 Kurson blends the story of 17th century Captain Joseph Bannister, 21st century divers John Chatterton and John Mattera and the zany world of shipwreck hunters to create an exciting and engaging read. The book swiftly transports the reader from the shores of the present day United States and Dominican Republic to the 17th century and back again as Chatterton and Mattera seek to solve the mystery of where lies the wreck of the Golden Fleece, a pirate ship captained by the enigmatic Joseph Bannister. Coming in at just under 250 pages, Pirate Hunters is a quick read (the author read it in a day of air travel), but covers a great deal of ground and introduces the reader to such legends within the Florida wreck diving community as Bob Marx. Readers will be amused and enthralled at the colorful stories of Chatterton and Mattera’s efforts in the Dominican Republic, stories which typify the rough and tumble life just a few hours flying time from US shores. A minor quibble with Kurson’s writing is that he devotes a significant amount of the short work to the life stories of Chatterton and Mattera. While this fleshes them out as real life men, the amount of pages devoted to their back stories detracts from their groundbreaking work in the Dominican Republic and the story of the sinking and salvage of the Golden Fleece. Overall, though, Pirate Hunters is a great book to enjoy as one soaks in the last few days of summer. 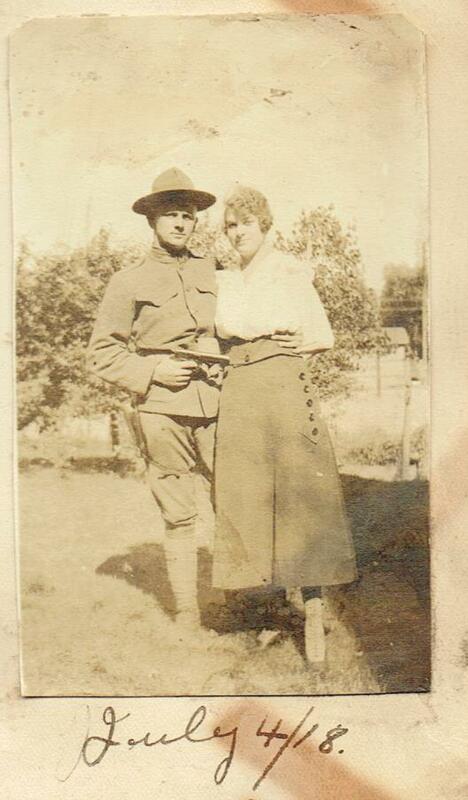 A post written by the author for another website didn’t include an illustration of his great-grandfather, Ernest Kronenfeld, who served in the Great War. In early 1862, the ladies of Savannah, Georgia came together to raise funds to partially pay for the construction of an ironclad to defend their native city. Dubbed the “Ladies’ Ram,” the vessel was launched on May 20, 1862 and commissioned as the CSS Georgia in July 1862. Like many of the Confederate Navy’s other ironclad vessels, the Georgia suffered from weak engines which kept her from making any serious effort to sally forth and break the Union blockade of her home port. Instead, the vessel was utilized as a floating battery and moored in a location where she could be warped so as to bring either broadside to bear on attacking vessels. Her career ended suddenly on December 20, 1864 as General Sherman’s March to the Sea brought him ever nearer Savannah. Although partially salvaged for her armor of iron rails, the Georgia remained at the bottom of the Savannah River perilously close to the main shipping lane. Rediscovered in 1969, the vessel is now about to undergo a final salvage effort by the US Navy’s Mobile Diving Salvage Unit 2. The removal of the ship is necessary to complete a $703 million channel dredging project to enlarge Savannah’s shipping capacity. The unit will work from June 1 to July 20 to remove the ship’s armor, steam engine, superstructure components and arms and armaments. Following their salvage, the items will undergo conservation at the US Naval History and Heritage Command’s Conservation Research Laboratory in College Station, TX. 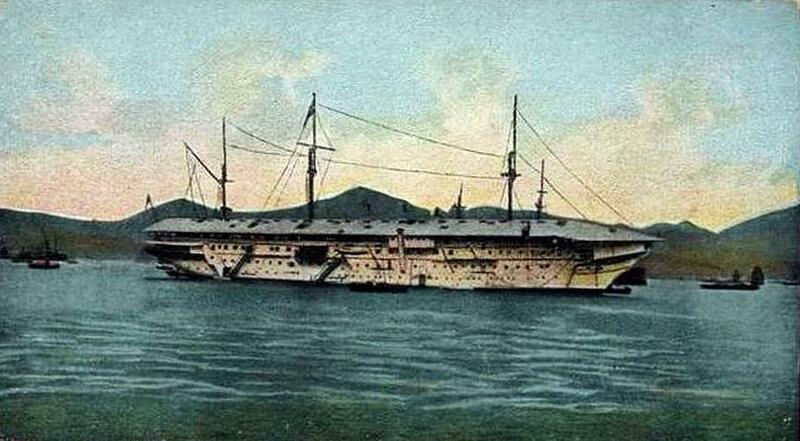 According to a report by the South China Morning Post, the remains of the HMS Tamar may have been discovered in the midst of the Wan Chai Development project in Hong Kong’s Victoria Harbour. If the vessel is indeed the Tamar, then its re-discovery dredges up a chapter in Hong Kong’s history that most of the cast of characters involved would prefer remain silent. Built in 1863 (some sources state she was launched in 1865), the Tamar was named for the Cornish river Tamar in southwest England and was the fifth vessel to carry the name. 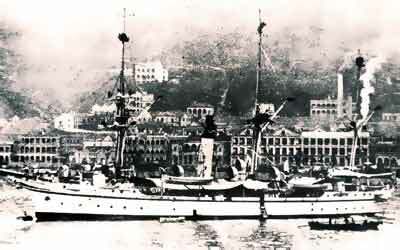 Tamar arrived in Hong Kong on April 11, 1897 as a transport vessel and was transitioned to a floating office and depot ship. For the next forty-four years she served in this capacity until Hong Kong was threatened with Japanese invasion in December 1941. On the night of December 11/12th, the Tamar was towed out to deep water and scuttled, however, due to her enlarged superstructure, the vessel did not sink immediately and shore artillery had to finish the job. Thirty-five of the two hundred fifty ship’s company of sailors and Royal Marines perished in the next two weeks as the British fought against long odds to hold off the Japanese invasion force. Following the liberation of Hong Kong in 1945, the wreck was removed so as not to be a hazard to navigation and the Royal Navy’s shore station was renamed HMS Tamar in 1947. Despite the salvage effort, it is likely elements of the ship’s keel and lower decks were left in the mud of Victoria Harbour. This is most likely what was rediscovered by the Wan Chai Development crews and how the vessel is treated is an open question perhaps many would rather not have asked. The scuttling of the Tamar is a reminder to Britain of her embarrassing defeat in Asia during World War Two – the loss of Singapore, Hong Kong and HMS Prince of Wales and HMS Repulse to the Japanese severely undermined Britain’s primacy in Asia. It is also a reminder to the People’s Republic of the eight years of misery they endured at the hands of the Japanese as well as the ignominy of having certain ports colonized by foreign powers. Finally, it reminds Japan of a past it would at times rather forget.